Time For a New Coat! I'm in need of a new coat. My best friend and I were discussing last night how we haven't bought a new coat in like 2 years! I've purchased tons of sweaters, cardigans, etc. but no coat. Wow! Didn't notice because for one, I live in FL, and two, I don't really travel much in the winter months. But with all the updated looks for this classic item, I thinks it's time for me to make another purchase. Also, I've been looking at several styles that the celebs are rocking and I am a visual shopper (in other words, I don't need to touch it or try it on). Take a look at both Estelle and Beyonce below. I've chosen my first round picks below, now I need to see if there are any items that catch my eye between now and Saturday. Love this coat. It's not overly bulky but it does have enough room for layering. The wide collar around this peacoat gives this classic style a modern update. I like this coat for it's vintage feel. I actually believe I've spotted something similar in Goodwill for like, $4.00. Such a classy coat. I love the structure and multiple, large buttons. Fab! I think the details on this coat is great but with that price, I'm wondering just how warm I'll be. 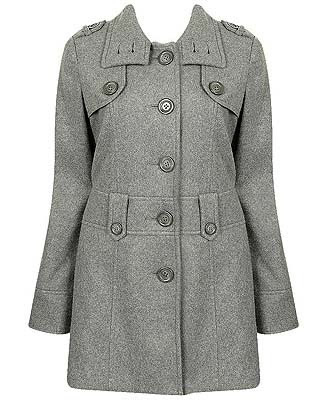 This coat is a classic Mary Tyler Moore look. The purple color brings this look on trend for '08. It has been a world wind these past several weeks! I thank the good Lord and my wonderful fashion friends for your support with my new endeavor. I just LOVE you all to pieces!!! I cannot believe temperatures are still ignoring the seasons. It was super hot when I wore this little casual number. I really appreciated the tint on these beautiful sunglasses guys. That sun was fierce! My clutch was the perfect piece to top this look off. For its size, it's pretty roomy. I just love these types of sleeves. But they are the worst when it comes to eating, LOL. I avoided getting these stained only because I rolled these suckers up. Haaaa!!!! I love this purse so much. I know I'm matching hard with my heels but oh well. 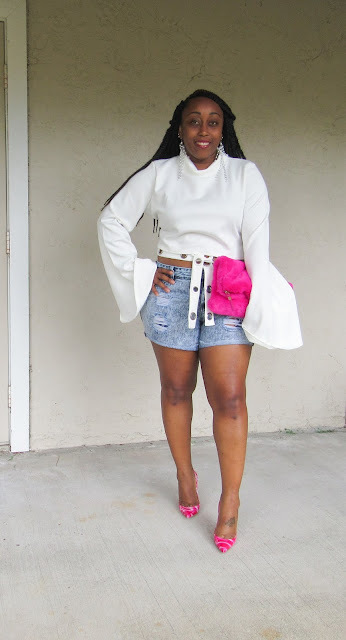 Earrings - Forever 21 Top - Boohoo.com Shorts - Forever 21.com Clutch - Boohoo.com Heels - Christian Louboutin Follies Have a safe and wonderful weekend! Despedida! Welcome to the new and improved Top It Off blog. 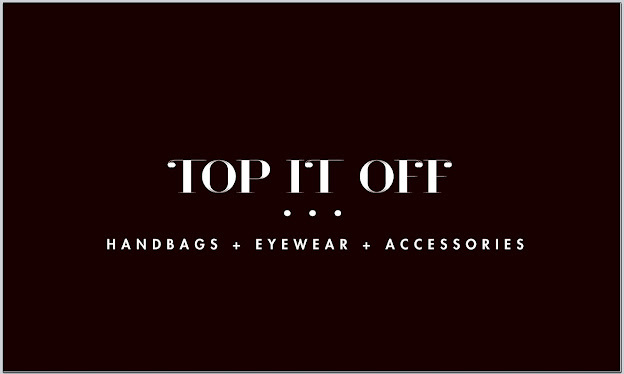 This blog will focus on looks featuring accessories from online retailer Top It Off. We are so excited to continue this fashion journey!!! 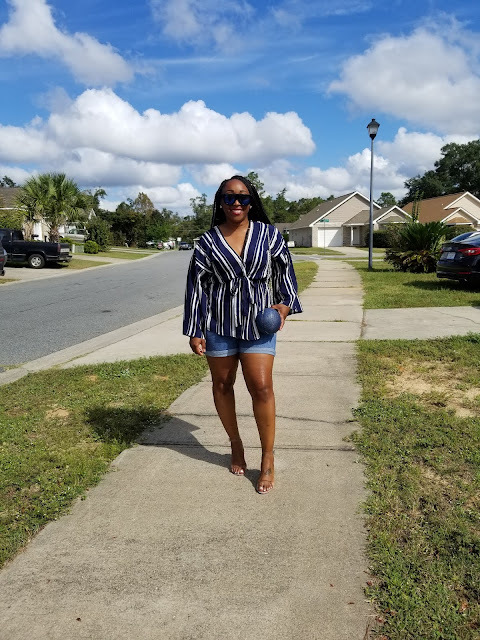 Please feel free to head on over to Top It Off, the place where you can find the perfect piece for every look!!! I love an all black look....don't you? 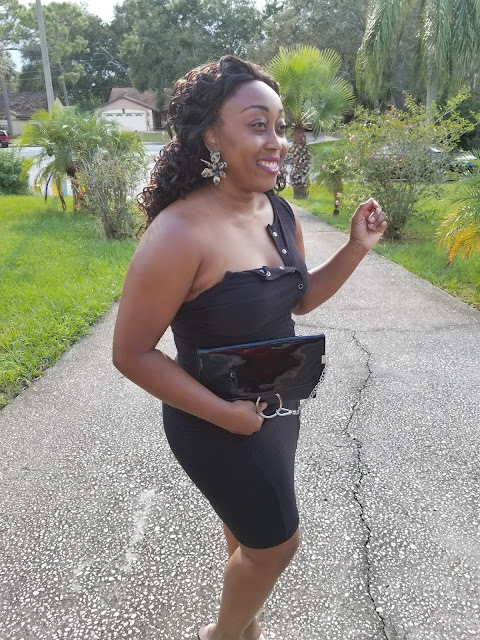 I accessorized this fitted LBD with our Ring and Chain Accent Flap Bag and our statement making Chunky Acetate Flower Drop Earrings. Here's a funny TMI story about this dress. So I'm getting ready and my hair gets caught by the dress. As I'm trying to fix it, my arm gets trapped. By this time I'm frustrated and hot, lol. I look in the mirror and boom....I like the look of it. And that ladies and gentlemen is referred to as accidental styling!!! !